Every time we go out to eat at a restaurant or even grab take out, it seems that the prices for food only keep rising. As a result, I decided to start figuring out ways to allow us to still enjoy dining out without breaking the bank. Do you want to stretch your dining dollars to go twice as far? 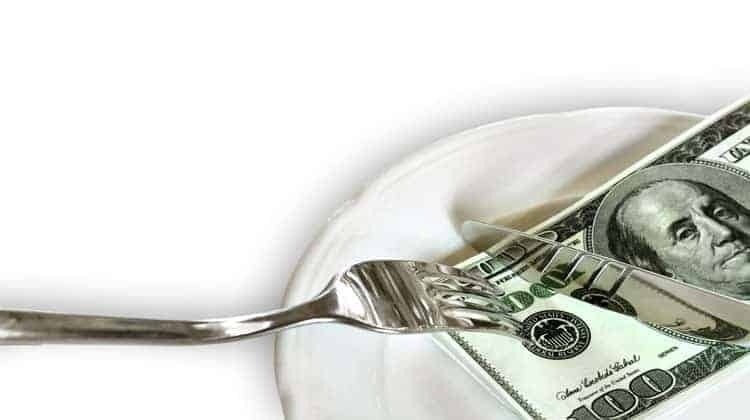 Here are some simple tricks for you to start using to make your money last while eating out. Nowadays, the size of an appetizer is the size of what your meal should be! I’m not joking either. If you look at what an actual portion size should be, you would be amazed. And with the size of appetizers, eating just an appetizer should be enough the make you full. To stretch your dining dollars the furthest, go out to eat during happy hour and get 1/2 price appetizers! Many restaurants are now charging for refills of soda. And in some cities, there is an astronomical tax on sugary drinks. Just ordering a soda will run you close to $5! So stick to drinks that offer you a free refill. Or better yet, drink water. It’ll save you the most money. Many restaurants are now offering combo deals. You can get an appetizer, main course and a desert for less than most other menu options. Of course, you don’t need to eat all of this food at one sitting. So to stretch your dining dollars, order the combo meal and only eat the appetizer or the main dish. Take the rest home to eat at another meal. Another option is it split a meal with a friend. Just order one dish but ask for two plates. However, before you do this, be sure to ask your server. Some restaurants don’t allow this or will charge you extra for doing so. With that said, I’ve really only seen it at higher end restaurants or during special promotions or on holidays. Many restaurants offer discounts and free items and it only takes a minute to enroll. The best time to score a free meal is on your birthday. Here is a list of over 100 places to get freebies on your birthday. Also pay attention to buy one, get one free deals and the fine print. For example when my husband and I were out, the restaurant was offering this deal. My husband ordered a chicken-fried steak dinner and I got my usual green chili fries, which were a whole lot cheaper. I was thinking that the fries were an appetizer, and we’d get the dinner free but I was wrong. The fries were free and we paid for the entrée. I could have had a full dinner, instead of skimping with the fries and it would have been the same price. I did the same thing just a few weeks earlier, ordering a cheaper burger when I could have had the luxury one with all the trimmings. Finally, be sure to follow your favorite restaurants on Facebook for special coupons. And if you give the restaurant your email, they can send you deals as well. Just be careful with this. You might end up eating out and spending more money as a result because of the emails. Bread can be sliced thin and used for toast, or crumbed for topping casseroles. Or give it to your grateful dog. Even green garnishes make a nice addition to soups, chopped fine and simmered briefly. Leftover steak, chicken or pasta dishes makes a tasty addition to stir-fries, or used as a filling in breakfast omelets. At the end of the day, anything that is left on your plate can be used for another meal. It might not make another full meal, but it can used for part of a meal, saving you money. Make dining out a treat, not the rule. Going out less will make those occasions more memorable and save you in the long run. And when you do eat out less often, you can afford to splurge a little more without it having a negative impact on your monthly budget. In all, you can save a lot of money when dining out if you are smart and think ahead. One of the biggest downfalls for most of us is that we wait until we are starving to go out to dinner. This causes us to order more than we need and eat it all too. Learn to control your cravings and you will easily stretch your dining dollars farther than you thought possible. Great tips!! I try my best to split entrees with a friend to gut down on the cost of eating out. It seems that some meals are being made smaller and the price is still the same or even more. One example: the chicken finger basket at Applebee’s. I used to get 4 tenders and a lot of fries. Now I get 3 smaller tenders and a lot less fries for the same price. Solid tips. One that we sometimes use, especially when getting carry-out or delivery, is to order kids’ dishes, even if for adults. For instance, Brio Tuscan Grille has a kids’ lasagna that is huge and tastes great, but costs something like $7.